Accepting credit cards at your business opens you up to a large amount of potential liability. In order to establish adequate security, you must have the right tools and more importantly, the right partners. Choosing Coffee Shop Manager and Granbury Solutions as your technology experts provides you with more than basic reassurance about your business's data security. We provide you with reliable, fast, affordable and secure credit card processing with the help of our industry leading payment processing partners. Competitive Industry Rates. You get an unbeatable processing rate thanks to our bulk buying power. Quick Payment Processing. Payment acceptance has an average authorization time of only 2-4 seconds. Processing through your POS gives you Convenience. Forget the hassle of 3rd party software or separate hardware. Now your POS terminal can quickly and easily process your transactions. Sophisticated Security. You don't have to store any sensitive cardholder data at your store. Each Swipe is Encrypted. When you swipe a customer's card, the data is automatically encrypted to protect the information. Gift Cards, too! Easily include gift cards in your program. 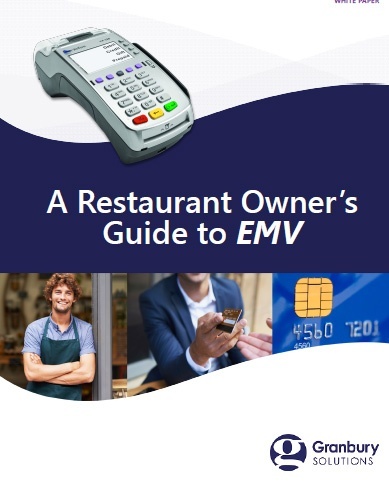 If you process credit cards in your restaurant, you’re probably starting to hear about new payment technology and the upcoming EMV Liability shift. Also called “Chip-and-Signature,” EMV is quickly becoming the global standard for secure credit card payments as these cards contain an embedded chip that protects cardholder information from becoming vulnerable to fraud. Download our free guide to learn more. Payment Card Industry (PCI) established the PCI Security Standards Council to enforce high standards for the security of cardholder data. Since July 2010, all merchants who take credit cards must maintain PCI compliance. Your business's responsibility to be PCI Compliant goes beyond using certified software – it also means securing your computer network, controlling access to cardholder data and regularly monitoring your system. CSM can help you fulfill the obligations of PCI compliance. Navigating the challenging requirements of credit card and network security can be challenging, so CSM partnered with TrustWave, a leading provider of managed network and PCI compliance services. As Coffee Shop Managers official network security partner, TrustWave can help you protect your business and your customers. Fill out the form below to speak with a security expert about integrated credit card processing options.